Have you ever had problems with speaking English? - Just don't feel confident about talking English? - You fear of making mistakes? ---> Do you want to Speak English Fluently? ---> Do you want to Speak English Confidently? So how do you speak English fluently like a native speakers with no fear and be confident? You must practice speaking, speaking, and speaking! No more worries about speaking English now because you have got MYANMAR SPEAKS ENGLISH App. MYANMAR SPEAKS ENGLISH is an FREE Learning English Application, Easy to learn English speaking, listening daily. 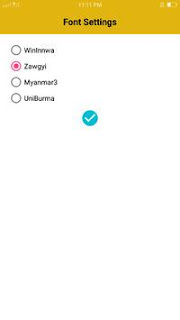 This Application is for all Myanmar citizens who want to improve and learn English with Myanmar meaning. MYANMAR SPEAKS ENGLISH will help you learn speaking English, listening English with 100 conversations in particular communicative situation, 1000 most common phrases, words and IT'S ALL FREE!!!. You will not find any better Learning English Application than this.